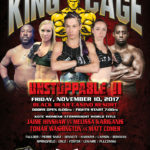 King of the Cage > Press Releases > King of the Cage Advances the Female Divisions of Both 105 and 115 lbs. King of the Cage Advances the Female Divisions of Both 105 and 115 lbs. Also, KOTC has reached out and signed Chelsea Faulder at 115 lbs. 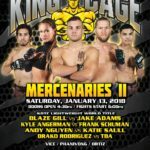 King of the Cage CEO Terry Trebilcock states, “Chelsea has been on our radar for some time. We watched her make a name for herself in local shows in the Columbus, Ohio area, and knew it was finally time to watch her fight her bouts with us on MAVTV. Her aggressive stand up style has made her a crowd favorite and will surely transfer over for TV viewers.” Chelsea has also signed a 6-fight deal and looks to have her first fight on the contract in October of this year. With fighters like Stephanie Fausto, Cynthia Arceo, Cassie Robb, Laken Jowers, Bi Nguyen and Andy Nguyen that can also fight at 115 lbs., look for this division to secure the headlines of women’s MMA for the next few years. Finally, KOTC also announces the signing of Susan Phanivong, who is an up-and-coming amateur fighter at 125 lbs., who presently has been filling up venues in Iowa. Susan is a registered nurse that has decided to add knocking out opponents to her medical profession.